I spent most of lunchtime at the DMV yesterday, so I'm late posting this review. 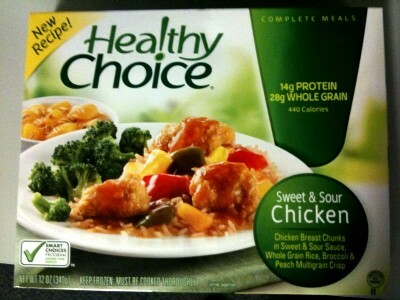 "Chicken Breast Chunks in Sweet & Sour Sauce, Whole Grain Rice, Broccoli & Peach Multigrain Crisp." Mmm, breast chunks. 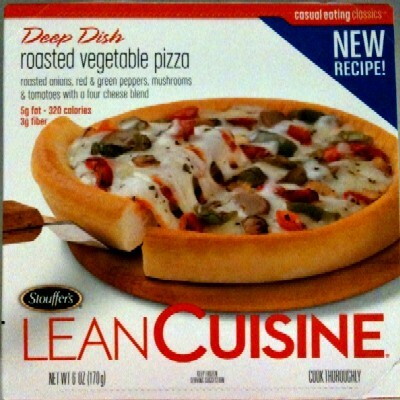 "Roasted onions, red & green peppers, mushrooms & tomatoes with a four cheese blend." This is the one that Tim likes. "With cavatappi pasta, zucchini, black olives & parmesan cheese". Cavatappi sounds exotic, but it's basically macaroni. 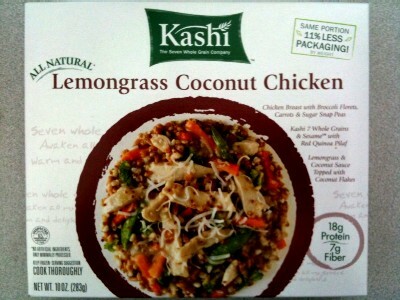 "Chicken Breast with Broccoli Florets, Carrots & Sugar Snap Peas; Kashi 7 Whole Grains & Sesame with Red Quinoa Pilaf; Lemongrass & Coconut Sauce Topped with Coconut Flakes." Shrimp devil? 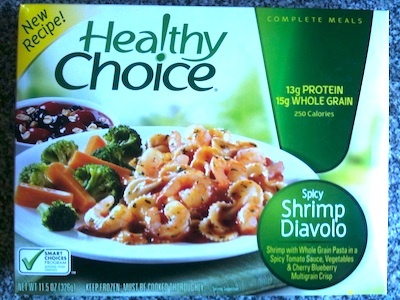 "Shrimp with Whole Grain Pasta in a Spicy Tomato Sauce, Vegetables & Cherry Blueberry Multigrain Crisp." Sorry there was no post yesterday, by the way. 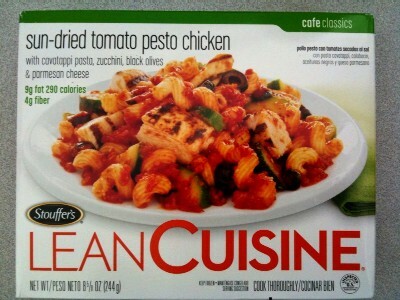 After a Valentine's day weekend of gourmet food, I just wasn't hungry for a frozen meal yesterday. "Italian seasoned meatballs with grilled red and green peppers, onions, mozzarella cheese and a zesty marinara sauce on Italian bread." 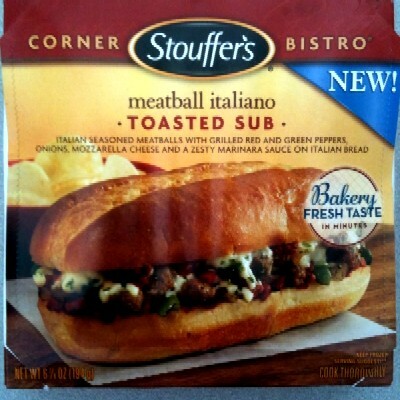 Note to Stouffer's: calling it "Italiano" doesn't actually make it Italian. 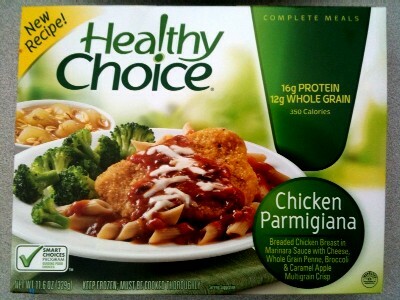 I'd have been more impressed if they'd called it "polpetta Italiano", though I suppose then fewer people would buy it. Oh, forgot to tell you... it was free pizza day at work again, so there's no frozen lunch for today. I actually had brought something and considered eating it as a snack, but I overindulged on pizza as it was, so I thought better of it. 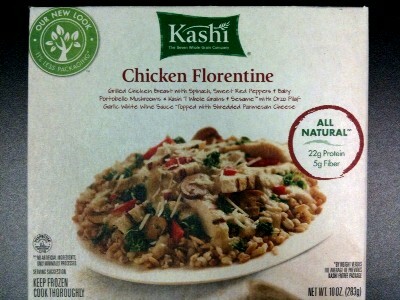 "Grilled Chicken Breast with Spinach, Sweet Red Peppers & Baby Portobello Mushrooms; Kashi 7 Whole Grains & Sesame with Orzo Pilaf; Garlic White Wine Sauce Topped with Shredded Parmesan Cheese." Instead of my usual frozen meal, I went out to lunch with Amy, to a sports/fern bar called Kickback Jack's. It's a new chain that's been opened by the same owners as Tripp's and Rock-Ola, and the menu is similar: tasty but horrifically unhealthy. I won't even try to imagine how many calories or fat grams were in the blue cheese burger I ate today. 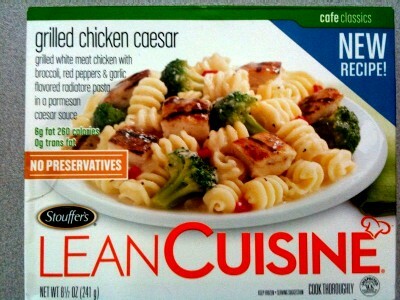 "Grilled white meat chicken with broccoli, red peppers & garlic flavored radiatore pasta in a parmesan Caesar sauce". 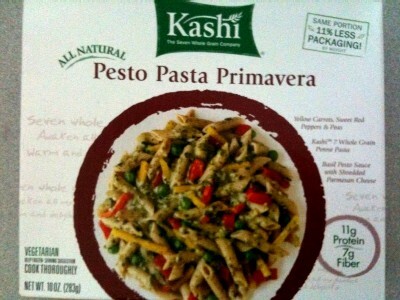 "Yellow Carrots, Sweet Red Peppers & Peas; Kashi 7 Whole Grain Penne Pasta; Basil Pesto Sauce with Shredded Parmesan Cheese." 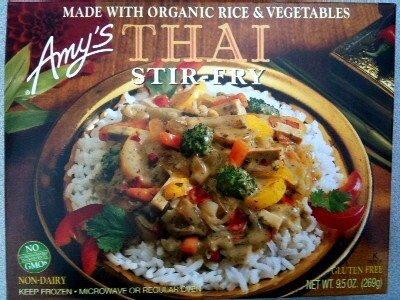 "Made with organic rice & vegetables." 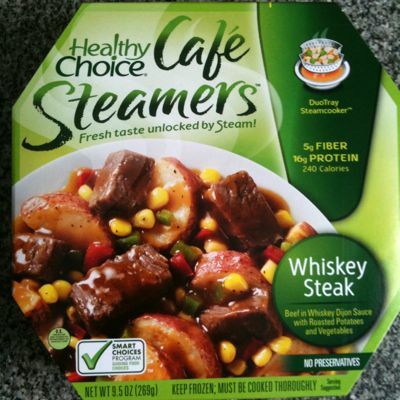 "Beef in Whiskey Dijon Sauce with Roasted Potatoes and Vegetables." Or is it Pizza Pesto? 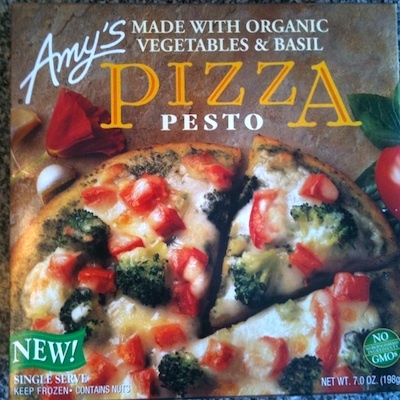 "Made with organic vegetables and basil."